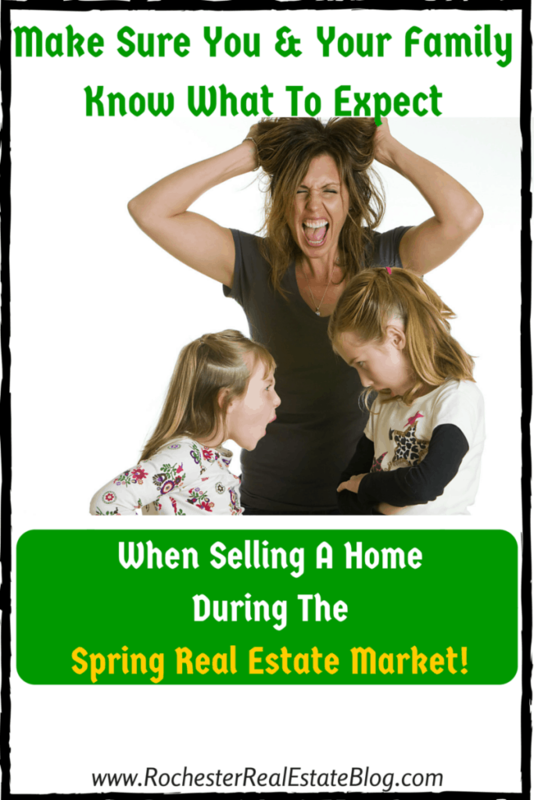 Are You & Your Family Prepared For The Spring Real Estate Market? The spring real estate market is often very fast paced. It’s important that a seller who will be selling their home in the spring real estate market that their family and themselves understand what to expect. If a home is priced and marketed properly, the first week that a home is listed for sale should be a mad frenzy of people wanting to view the home, hopefully generating a multiple offer scenario. This may mean that a seller and their family may have to leave their home several times in a day while private showings are occurring. It’s important that a seller and their family is prepared to accommodate private showings with reasonable notice. Sellers who turn away showings because it is an inconvenience for them may potentially be costing themselves money and quite frankly, a sale of their home! If a seller happens to have kids or pets, the importance of understanding the expectations when selling a home during the spring real estate market becomes even more important. Inevitably, a seller who has a kids, pets, or both will have additional challenges when selling their home. If this is the case, knowing how to sell a home with kids or pets becomes crucial. Is Your Home Prepared For The Spring Real Estate Market? Once a seller prepares themselves and their family for the spring real estate market, it’s now time to make sure their home is prepared. It’s very important that when selling a home, whether it’s during the spring or not, that a seller understands how to prepare a home for the real estate market. Below are many of the interior, exterior, and general tasks that should be completed prior to selling a home during the spring real estate market. Below are some of the most important interior tasks to complete when preparing a home for sale. Many of the tasks below are low cost home sale preparation tipsand in many cases, cost nothing except for time and effort. The curb appeal of a home can make a huge difference when it comes to whether or not a buyer elects to view a home. If a potential buyer drives by a property that looks neglected from the exterior it is possible they will decide to not look at the home. Below are some of the most important exterior tasks to complete when preparing a home for the spring real estate market. There are specific home maintenance tasks that homeowners should complete prior to selling their home. It is very easy to detect when a homeowner has neglected their home, simply by walking through it. Below are some of the most important general tasks to complete when preparing a home for the spring real estate market.